Can you walk on a metal roof without damaging it? What temperature is too cold to install shingles? Can you walk on cedar shake roof? Yes, and here’s how! 5 Things You Must Know: Can Roofing Be Done in Winter? After spending more than 40 hours of researching, and comparing dozens of top-rated nailguns, we found the Metabo (Hitachi) NV45AB to be the most reliable and the best roofing nailer available on the market. It was a hard decision to pick one single favorite because the MAX Superroofer and Bostitch RN46-1 are also excellent picks. Whether you are a DIY-er looking for a roof nail gun to use on a small project, or if you’re a professional contractor or roofer looking for the best roofing gun out there to work on long tough projects, we have great picks. If you want to know what was the criteria we used for evaluation, please check the end section below the picks. The article is long, so if you want to jump to the section you’re most interested in, please use the table of contents. From dozens of different models and top-rated brands, we selected the 6 best nail guns of 2019. Let’s get started. Update March 2019: Hitachi Power Tools changed their name to Metabo HPT. The tools are the same, only the name is new. Perfect for professional use on long-term tough projects. We believe this nailer is the best on the market, perfect in terms of performance, definitely made for professionals. It’s a reliable tool, versatile, quiet and extremely durable. Comfortable to operate and comes with rubberized pads for extra protection. This Hitachi NV45AB2 is our favorite roof nailer, and it’s surely one of the most popular roofing nail-gun available today. It’s lightweight, it has an easy side-load, it’s comfortable to hold, easy to maneuver, durable and made to withstand extreme wheater conditions (hot or cold). It’s a well-known tool used for many different construction jobs, but mostly for installing asphalt shingles or insulation boards. It features a side load magazine, that accepts 120 wire collated nails. One of the things we like the most about this Hitachi model is that it can precisely drive very small nails. The tool can fire nails sized from 7/8-inch to 1-3/4-inch having a shank diameter of 0.120-inch. The tool is very durable, the metal housing protects it from the harsh circumstances. This shingle nail gun is roofing-friendly, and it comes with a shingle guide which allows you to control the shingle spacing in a precise way. You can adjust the nailing depth by turning the scrolling knob adjuster clockwise or counter-clockwise. It has two types of operation: intermittent operation, continuous operation. The quick-driving feature is preferred: the shingle nailer fires nails each time the tip of the tool bumps the work surface. What we also liked was the rubberized grip for extra comfort and the pads on the side, which prevents the tool to slide off a pitched roof when you’re not using it. It’s really easy to operate it with one hand, giving a really nice balance always keeping you in control. A popular reliable tool ideal for professionals. Undoubtedly, the most popular and trusted roofing nailer in the world, perfect for anyone. It’s lightweight, durable, has a very comfortable grip, it doesn’t misfire or double fire and it can drive up to 100 nails per minute. Another top choice is the Bostitch RN46-1, which in our opinion is the second best roofing nail gun available on the market. Comes with a zero nail lockout, meaning that you won’t experience any dry firing when the magazine is empty. It’s a must-have tool for everyone: from professional contractors, construction workers, roofers, and DIY enthusiasts. It accepts coil roofing nails of 3/4” to 1-3/4” (19 – 45mm) with .120” (3mm) shank diameter. It comes with two different types of Operation: Contact Trip and Sequential Trip. The contact type, also known as “bump“, allows you to drive nails in succession. All you need to do is to hold down the trigger, and each time the tip touches the work surface, a nail will be fired automatically. For beginners, please have in mind that while the contact trip may be faster, it may get difficult to control and it can get dangerous. The sequential trip is safe and at the same time a fast way to drive nails efficiently. This coil roofing nail gun fires nails only when you’re actually holding the tool against the work surface and then press the trigger. With this Bostitch nailer, you’ll be able to get the right depth of drive for the job. It comes with a depth dial that allows you to choose from 5 different levels, from flush, shallow or deep countersink. The “dial-a-depth” fastener is practical and easy to adjust even if you’re wearing gloves, you just have to twist it right or left to adjust the desired depth. The tool is an ideal nail gun for shingles. At the bottom of the tool, you’ll find the shingle guide. Along with the flat tip, it allows for accurate placement of shingles and a precise distance of the nails. The tool is made to withstand rough working conditions and it’s made of a tough yet light aircraft grade aluminum. The grip is slip-resistant and comfortable to hold. It’s a versatile tool that can be used for inside and outside jobs, from roofing, insulation, cement and more. Superior quality, well-built and made to last. It’s a rugged tool, very durable, versatile, lightweight, with a cast aluminum housing. It feels light, comfortable and easy to maneuver all day long – definitely one of the best roofing nailers. This SuperRoofer MAX CN4453 is another top-ranked model, having lots of positive feedbacks from professional roofers around the world. We were pleasantly surprised to see that so many roofers and professional contractors with 10+ years of experience said that this MAX SuperRoofer is the best nailer they’ve ever had. And these people who have already tried all the other popular brands out there like the Bostitch, Paslode, Senco, or Hitachi. The versatility of the tool stands out, it can be used on asphalt and fiberglass shingles installation, as well as on fastening lath wire to plywood, siding installation and more. The magazine holds 120 coiled nails, angled at 15 degrees and it features two types of operation: contact trip and sequential trip. The only downside is the price which is a bit higher, especially if you are a DIY-er or want to use the nailer for smaller projects. If you’re a professional contractor or roofer, then we would definitely say it’s well worth the money. Great for professional, industrial, DIY use. An easy to use and rugged roofing nailer. A simple nailer that does its job just right. Porter-Cable RN175B is an excellent model for professionals and for DIY-ers. It’s easy to use, all the pieces are placed logically to get you going right away. It’s well built, light, comfortable, durable, and easy to operate with one hand. The magazine is large, easy to access for quick reloadings. It accepts coil roofing nails from 3/4 inch to 1-3/4 inch, with the shank diameter of 0.12. It has two different firing modes: contact (bump) and a single sequential. It’s constructed to withstand the abuse and the harsh conditions on the roof. The ergonomic grip is rubberized, the rounded body gives extra comfort and a nice balance. The tool is roofing friendly, comes with a handy shingle guide placed at the bottom to ensure accurate placement of the shingles every time. The rugged design and the metal housing adds up to the durability, making the tool last you a very long time. One negative thing we notice when reading through this roofing nailer reviews, some people complained that it jams once in a while. The solution to this issue would be to lubricate the nailer before each use, this will also increase its life. This Roof Pro model from Senco is made for professionals who want a high-quality and extremely durable nailer, which can handle large roofing projects. Accurate nailing, made in USA, well-balanced and feels a bit heavy after extended use. SENCO manufactures its tools and fasteners in the United States, Ohio. The brand is one of the most trusted brands in the USA, known for high-quality products. It’s designed with a durable housing, designed to withstand the abuse. Some contractors who love speed said that this nailer is a bit slower. What we like most about this tool is that it fires the nails accurate every single time. The balance is fantastic and helps you shoot the nail in the right spot all the time. That’s a great thing if you value high-quality work. It has a comfortable grip, but after extended use, the nailer itself can start to feel a bit heavier and you might experience some forearm fatigue with it. It’s a rugged model, solid-constructed made from all aluminum, steel flanges on the side. It’s a versatile power tool that can be used in different construction jobs, for installing shingles, underlayment and more. Good lubrication is a must for every nail-gun you own, it’s important to not forget to oil them as often as you can. The best bang for the buck roofing nailer. This WEN coil roofing nailer is the best budget option you can find on the market. The price is fantastic and the quality is pretty decent. Excellent for DIY small roofing projects. Not recommended for professional use. We recommend this tool for small roofing projects or for DIYers. It’s not for professional contractors or roofers who are on the roof every day. It’s a versatile tool, can be used for multiple purposes: roofing, siding, small DIY projects, indoor and outdoor. For small projects, the nailer does its job admirably for the price, it’s a bit heavier, but still, it’s easy to operate with one hand. The main negative thing about this tool is that it shoots double nails on a fairly regular basis. So if you’re a professional installing large roofs every day, then you definitely don’t want a nailer that constantly double fires. The magazine is large, holding 120 coil nails, and it’s easy to release to access the nails. For the price, I didn’t expect to come with anything else besides the actual nailer. But surprisingly, the tool comes with a nice carrying case which includes tool oil, adjustment wrenches, safety glasses. That makes it the perfect beginner kit for DIY-ers. To increase the quality of nailing and to make sure the WEN nailer will last you longer, it requires lubrication before each use. If you’re a pro, working 10-12 hours a day, then you already know how important is the weight of your tools. The heavier the nailer, the more fatigue and pain on the forearm, elbow, shoulder, neck and eventually the whole body. A roofing nailer should be lightweight, easy to grip, to hold and to maneuver. It should be properly balanced, with an even weight distribution. The gravity center should be aligned with the center of the hand gripping the tool. In more simple words: the tool has to feel good in your hands, easy to grip and to operate with precision. To conclude, choose a lightweight nail-gun that feels good in your hands. This way you’ll increase your comfort, speed, productivity and the quality of work. You should pay attention to the handle of the tool. To avoid wrist pain and fatigue, you should always go for a handle that you can grip without you having to bend your wrist downward or upward. It’s always recommended to grab the handle of your tool with the whole hand, keeping your wrist straight. Look for ergonomic, rubberized, and anti-slip handles. If you’re a roofer, then you probably already witnessed tools dropping and being brutally thrown away. You need a solid-built nailer, that’s capable of taking a lot of abuse without breaking or malfunction. By any means, you should avoid plastic, since it’s the easiest material to get damaged. Go for metal, magnesium, aluminum cases. The most common sizes of nails used for most roofing tasks are between 3/4 inch (19mm) and 1-3/4 inch (45mm). 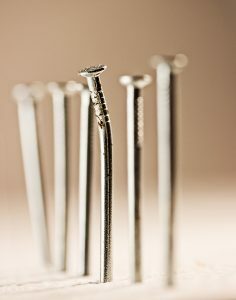 The proper roofing nailer should be able to accommodate these range of nail sizes. Hitachi roofing nail gun is really versatile, it can also drive small sized nails of 7/8 inch. That’s great if you need to work with that exact size. 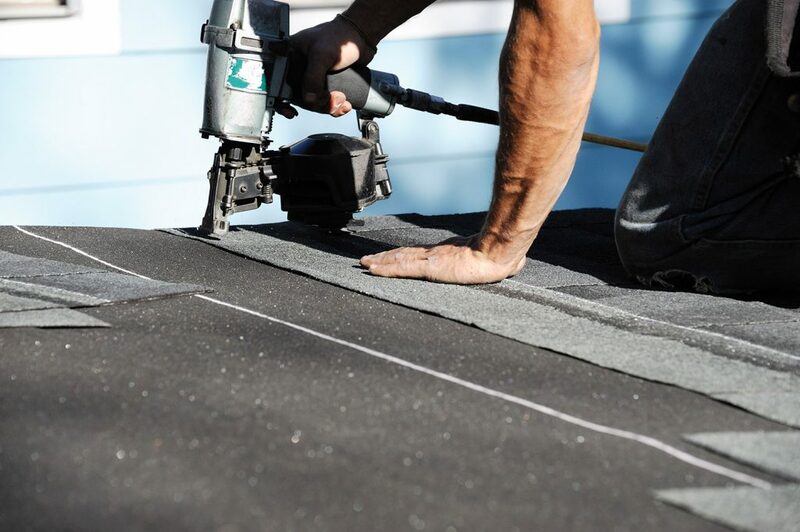 Experienced roofers nail very fast and precise – all that without losing the quality of the work. A professional contractor will always value this ability. For the best performance, a roofing nailer should be designed to handle high speed and high volume with efficient and accurate results. You need a roofing nailer that’s able to drive at least 1 nail per second. There are a wide variety of nail lengths and you always need to ensure that the nail depth is suitable for the nail’s length. When using a roofing nailer, it’s extremely important to have control over the nail depth. Sometimes, you need to drive the nails shallower into the work surface, sometimes you need to drive them deeper. It depends on the work surface material you’re working with and on the length of the nails you’re using. It’s critical to look for a nailer that is designed with an easy-to-adjust depth of drive feature. The adjuster should be placed somewhere easily reachable, so it won’t disrupt your workflow. Due to its round design, a knob is a perfect shape for a nailing depth adjuster. Twisting it right or left is easy and can be done even if the worker is wearing gloves. It’s recommended to always test some shots before you actually get to the shingles, to make sure the depth is appropriate. The most common firing modes (operation types) nailers have are contact/bump or sequential. If you want the fastest way to shoot nails, then the contact type is the best option. It allows you to drive as many nails as you want at once. Once you’re in the contact mode, all you have to do is to hold down the trigger, and every time you bump the nailer’s tip against your work surface it will fire a nail. This way allows you to work extremely fast, but if you’re inexperienced it can really affect the quality of the work. Accurate nailing, in the proper spots, is a must for a job well done. So make sure you can handle the speed while driving nails always with precision. If you want the safest and still quick way to drive nails, then the sequential mode is the right choice. Once you’re in the sequential mode, the nailer will fire a nail only if these criteria are followed: first you need to bump the tip of the nail-gun against the work surface and then pull the trigger. The nailer will not drive any nails unless you pull the trigger while the tip is pressed against the surface. For extra accuracy and safety, this sequential mode is the best type of firing nails. The place where the nails are being held is called the magazine. The best type of magazine layout is the side-load design. If you’re working on larger projects, then you’ll run out of nails pretty often and you’ll constantly need to reload the magazine. You need a roofing nailer with a magazine that’s easy to open/close and to reload. Simplicity is the key here. The process of reloading the magazine with a new coil of nails should be made effortless. The capacity of the magazine is also important, the more nails it can hold the better. It should hold at least 100 nails. Most of the models we recommended above, hold 120 nails. The most common types of power sources for roofing nailers are the following three: battery powered, pneumatic power and fuel-driven. Before buying a new nailer, you should already know what type of power source fits your needs best. If you don’t like air compressors or if you’re working in an inconvenient area where there’s no access to electrical outlets, then a battery powered nailer is the one you want. This type of tools is known as cordless nailers. They work on a battery powered motor, having an internal compressor. Yes, it’s a lot easier to get your tool ready for the job, but it won’t have as much power as a pneumatic nailer. The most common and powerful type of power source found in roofing nailers is the pneumatic power. The system is really simple: the pneumatic nail-gun is connected to an air compressor. Every air compressor requires a different air volume (CFM) and air pressure (PSI) to drive nails. It is crucial to pay attention that the CFM and PSI values to be compatible with the recommended values of your nail gun. 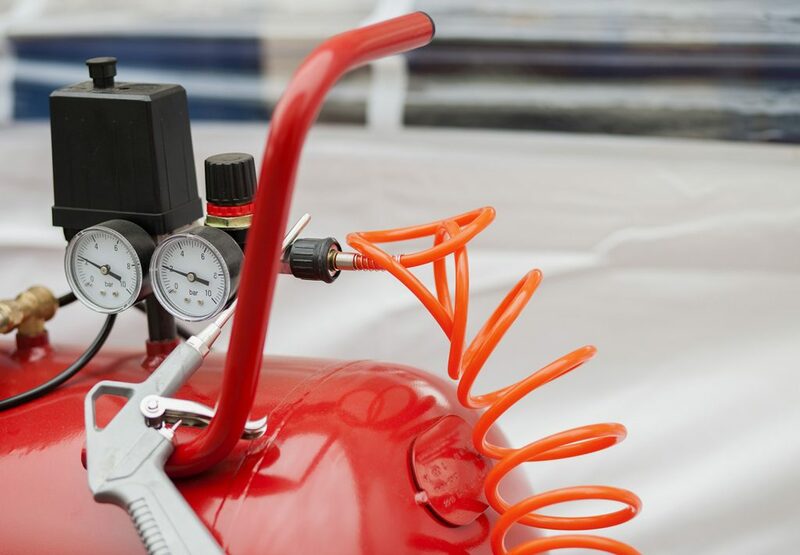 You can always rely on an air compressor to do its job admirably every time, and it’s perfect for big projects. The third type of source power is the fuel-driven type. The power comes through disposable gas cartridges fueled by an internal battery. Fuel Driven roofing nailers are as powerful as pneumatic ones. The downside is that you’ll always have to replace the gas cartridges, and in the long term it can get really costly. You need a roofing nailer that’s able to withstand harsh weather conditions. Either if it’s too cold or too hot, the tool should be able to handle it without any problems. Unfortunately, with lower-quality models, if the temperatures are too low or too high, they’ll stop working. You need a tool that you can rely on no matter the circumstances, that’s why we recommend the Hitachi Roofing Nailer that’s designed to withstand extreme weather conditions. 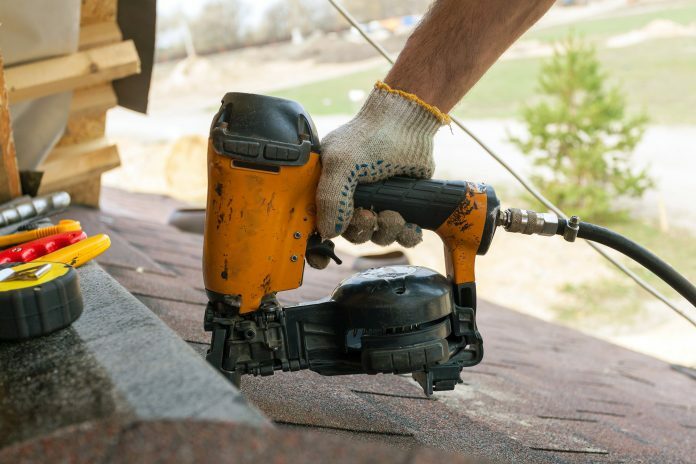 Since roofing nailers are usually used for roofing, it’s clear that these tools should help the roofers do their job easier. Many nail-guns come with a shingle guide included usually on the bottom of the tool. It’s an extremely helpful feature that helps the roofer align the shingles with high accuracy every time. ANSI clearly says that you must wear safety glasses if you are exposed to any flying particles coming either from the front or side. Safety should always come first, and even if you find glasses to be uncomfortable to wear, you should realize that it’s for your own good. 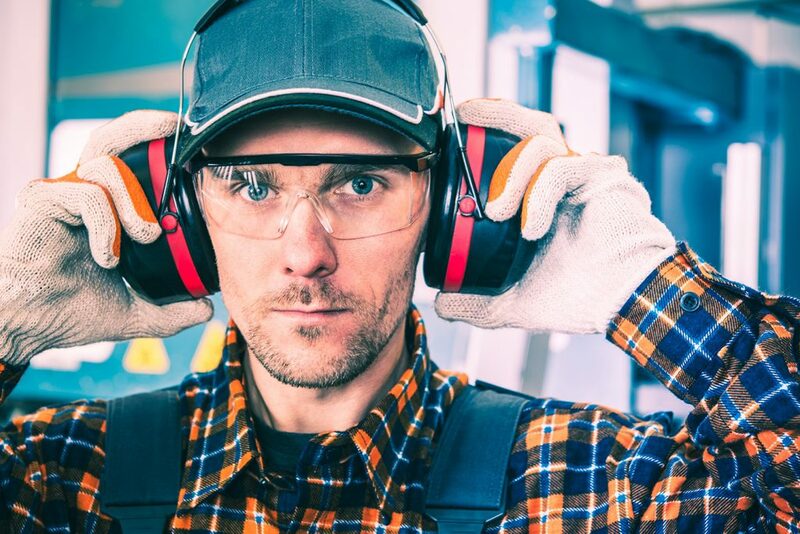 If the noise level is really high, your hearing can be damaged if you’re exposed to a high noise level. Air compressors and pneumatic nailers can be really loud. Hearing protection should be a must to avoid hearing damage. When loading the tool and operating the tool, you should be extremely careful. Do not point the nailer at anyone, do not place your fingers or your hands on the tip of the nailer. For your own safety and for your coworker’s safety, be cautious when maneuvering roofing nailers. Do not use any other power source than the one recommended by your nailgun’s manufacturer. Make sure that the PSI is between the recommended ranges. Here’s an infographic we made to guide you in the process of picking the best roofing nailers for your roofing process. BestRoofingShoes.com is a participant in the Amazon Services LLC Associates Program, an affiliate advertising program designed to provide a means for sites to earn advertising fees by advertising and linking to Amazon.com. Affiliate Disclosure: Bestroofingshoes.com is a participant in the Amazon Services LLC Associates Program, an affiliate advertising program designed to provide a means for sites to earn advertising fees by advertising and linking to Amazon.com.